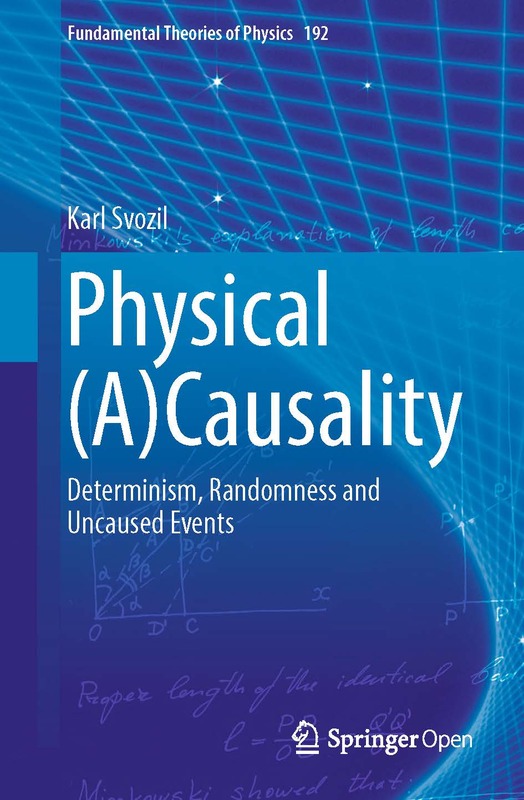 Karl Svozil, ``Physical (A)Causality. Determinism, Randomness and Uncaused Events'' (Springer, Cham, 2018), xiv+219 pages. Karl Svozil, ``Quantum Logic'' (Springer, Singapore, 1998), xviii+214 pages. Karl Svozil, ``Randomness and Undecidability in Physics'' (World Scientific, Singapore, 1993), xvi+292 pages. Cristian S. Calude and Karl Svozil, ``Spurious, Emergent Laws in Number Worlds'', Philosophies 4 (2), 17(13) (2019) , , [DOI: 10.3390/philosophies4020017], , [LaTeX], [BibTeX]. Andrei Khrennikov and Karl Svozil, ``Quantum Probability and Randomness'', Entropy 21 (1), 35(5) (2019) , , [DOI: 10.3390/e21010035], [LaTeX], [BibTeX]. Adan Cabello, Jose R. Portillo, Alberto Solis and Karl Svozil, ``Minimal true-implies-false and true-implies-true sets of propositions in noncontextual hidden-variable theories'', Physical Review A 98 (1), 012106(8) (2018) , , , [DOI: 10.1103/PhysRevA.98.012106], [LaTeX], [BibTeX]. Karl Svozil, ``New Forms of Quantum Value Indefiniteness Suggest That Incompatible Views on Contexts Are Epistemic'', Entropy 20 (6), 406 (2018) , , , [DOI: 10.3390/e20060406], [LaTeX], [BibTeX]. Hans Havlicek and Karl Svozil, ``Dimensional lifting through generalized Gram--Schmidt process'', Entropy 20 (4), 284 (2018) , , , [DOI: 10.3390/e20040284], [LaTeX], [BibTeX]. Karl Svozil, ``Quantum hocus-pocus'', Ethics in Science and Environmental Politics (ESEP) 16 (1), 25-30 (2016) , , , [DOI: 10.3354/esep00171], [LaTeX], [BibTeX]. Please see also the "Comment: Forum" piece Karl Svozil, ``Delivering on a quantum promise'', in the Physics World May 25th, 2017 issue . Karl Svozil, ``Orthogonal Vector Computations'', Entropy 18 (5), 156(1-11) (2016) , , , [DOI: 10.3390/e18050156], [LaTeX], [BibTeX]. Alastair A. Abbott, Cristian S. Calude and Karl Svozil, ``A variant of the Kochen-Specker theorem localising value indefiniteness'', Journal of Mathematical Physics 56 (10), 102201(1-17) (2015) , , , [DOI: 10.1063/1.4931658], [LaTeX], [BibTeX]. Alastair A. Abbott, Cristian S. Calude and Karl Svozil, ``A Non-Probabilistic Model of Relativised Predictability in Physics'', Information 6 (4), 773-789 (2015) , , , [DOI: 10.3390/info6040773], [LaTeX], [BibTeX]. Alastair A. Abbott, Cristian S. Calude and Karl Svozil, ``On the Unpredictability of Individual Quantum Measurement Outcomes'', ed. by Lev D. Beklemishev and Andreas Blass and Nachum Dershowitz and Bernd Finkbeiner and Wolfram Schulte, in Gurevich Festschrift II, Lecture Notes in Computer Science (LNCS) 9300, 69-86 (Springer International Publishing, Cham, Heidelberg, New York, Dordrecht, London, 2015) , , , [DOI: 10.1007/978-3-319-23534-9_4], [LaTeX], [BibTeX]. Volkmar Putz and Karl Svozil, ``Quantum Music'', Soft Computing 21(6), 1467-1471 (2017) , , , [DOI: 10.1007/s00500-015-1835-x], [LaTeX], [BibTeX]. Karl Svozil, ``Space and Time in a Quantized World'', International Journal of Theoretical Physics 54 (12), 4376-4385 (2015) , , , [DOI: 10.1007/s10773-015-2593-3], [LaTeX], [BibTeX]. Karl Svozil, ``Non-contextual chocolate ball versus value indefinite quantum cryptography'', Theoretical Computer Science 560 (Part 1, Special Issue on Quantum Cryptography), 82-90 (2014) , , , [DOI: 10.1016/j.tcs.2014.09.019], [LaTeX], [BibTeX]. Alastair A. Abbott, Cristian S. Calude and Karl Svozil, ``A quantum random number generator certified by value indefiniteness'', Mathematical Structures in Computer Science 24 (Special Issue 3), e240303 (2014) , , , [DOI: 10.1017/S0960129512000692], [LaTeX], [BibTeX]. Alastair A. Abbott, Cristian S. Calude and Karl Svozil, ``Value-indefinite observables are almost everywhere'', Physical Review A 89 (3), 032109 (2014) , , , [DOI: 10.1103/PhysRevA.89.032109], [LaTeX], [BibTeX]. Karl Svozil, ``Unscrambling the Quantum Omelette'', International Journal of Theoretical Physics 53 (10), 3648-3657 (2014) , , , [DOI: 10.1007/s10773-013-1995-3], [LaTeX], [BibTeX]. Alastair A. Abbott, Cristian S. Calude and Karl Svozil, ``On demons and oracles'', Asia Pacific Mathematics Newsletter (Alan Turing Special Issue) 2 (1), 9-15 (2012) , . Alastair A. Abbott, Cristian S. Calude, Jonathan Conder and Karl Svozil, ``Strong Kochen-Specker theorem and incomputability of quantum randomness'', Physical Review A 86 (6), 062109 (2012) , , , [DOI: 10.1103/PhysRevA.86.062109], [LaTeX], [BibTeX]. Volkmar Putz and Karl Svozil, ``Can a computer be ``pushed'' to perform faster-than-light? '', International Journal of Unconventional Computing 8 (1), 99-105 (2012) , , , [LaTeX], [BibTeX]. Karl Svozil, ``How much contextuality? '', Natural Computing 11 (2), 261-265 (2012) , , , [DOI: 10.1007/s11047-012-9318-9], [LaTeX], [BibTeX]. Karl Svozil, ``Quantum value indefiniteness'', Natural Computing 10 (4), 1371-1382 (2011) , , , [DOI: 10.1007/s11047-010-9241-x], [LaTeX], [BibTeX]. Martin Schaller and Karl Svozil, ``Zeno Squeezing of Cellular Automata'', International Journal of Unconventional Computing 6 (5), 399-416 (2010), , , , [LaTeX], [BibTeX]. Maria Schimpf and Karl Svozil, ``A glance at singlet states and four-partite correlations'', Mathematica Slovaca 60 (5), 701-722 (2010), , , , [DOI: 10.2478/s12175-010-0041-7], [LaTeX], [BibTeX] (Special issue in honour of Professor Sylvia Pulmannova). Cristian S. Calude, Elena Calude and Karl Svozil, ``The complexity of proving chaoticity and the Church�Turing thesis'', Chaos 20, 037103 (2010) [5 pages], , , , [DOI: 10.1063/1.3489096], [LaTeX], [BibTeX]. Cristian S. Calude, Michael J. Dinneen, Monica Dumitrescu and Karl Svozil, ``Experimental evidence of quantum randomness incomputability'', Physical Review A 82, 022102 (2010) [8 pages], , , , [DOI: 10.1103/PhysRevA.82.022102], [LaTeX], [BibTeX]. Karl Svozil, ``On the plasticity of nonlocal quantum correlations'', Ukrainian Journal of Physics 55 (5), 547-553 (2010), , , , , [LaTeX], [BibTeX]. Karl Svozil, ``The diagonalization method in quantum recursion theory'', Quantum Information Processing 9 (2), 295-305 (2010), , , , [DOI: 10.1007/s11128-009-0115-z], [LaTeX], [BibTeX]. Karl Svozil, ``Proposed direct test of a certain type of noncontextuality in quantum mechanics'', Physical Review A 80, 040102 (2009), , , , [DOI: 10.1103/PhysRevA.80.040102], [LaTeX], [BibTeX]. Karl Svozil, ``Three criteria for quantum random-number generators based on beam splitters'', Physical Review A 79, 054306 (2009), , , , [DOI: 10.1103/PhysRevA.79.054306], [LaTeX], [BibTeX]. Martin Schaller and Karl Svozil, ``Scale-invariant cellular automata and self-similar Petri nets'', The European Physical Journal B 69, 297�311 (2009), , , , [DOI: 10.1140/epjb/e2009-00147-x], [LaTeX], [BibTeX]. Karl Svozil and J. Tkadlec, ``On the solution of trivalent decision problems by quantum state identification'', Natural Computing 8 (3), 539-546 (2009) , , , [DOI: 10.1007/s11047-009-9112-5], [LaTeX], [BibTeX]. Cristian S. Calude and Karl Svozil, ``Quantum Randomness and Value Indefiniteness'', Advanced Science Letters 1 (2), 165�168 (2008) , , , [DOI:10.1166/asl.2008.016], [LaTeX], [BibTeX]. Karl Svozil, ``Quantum Scholasticism: On Quantum Contexts, Counterfactuals, and the Absurdities of Quantum Omniscience'', Information Sciences 179 (5), 535�541 (2009) , , , [DOI:10.1016/j.ins.2008.06.012], [LaTeX], [BibTeX]. Alexander Leitsch, G�nter Schachner and Karl Svozil, ``How to Acknowledge Hypercomputation? '', Complex Systems 18 (1), 131-143, (2008) , , , [LaTeX], [BibTeX]. F.A. Bovino, M. Giardina, Karl Svozil and V. Vedral, ``Spatial Orientation by Quantum Telepathy'', International Journal of Quantum Information (IJQI) 5 (1/2), 43-49 (2007) , , , [DOI:10.1142/S0219749907002517], [LaTeX], [BibTeX]. Karl Svozil, ``Staging quantum cryptography with chocolate balls'', American Journal of Physics 74 (9), 800-803 (2006) , , , [DOI:10.1119/1.2205879], [LaTeX], [BibTeX]. Extended German version: ``Dramatisierte Quantenkryptographie'', Wissenschaftliche Nachrichten 129 (November/Dezember), 37-40 (2005) . Karl Svozil, ``Are simultaneous Bell measurements possible? '', New J. Phys. 8, 39 (2006) , , , [DOI:10.1088/1367-2630/8/3/039], [LaTeX], [BibTeX]. Karl Svozil, ``Communication cost of breaking the Bell barrier'', Physical Review A 72, 050302(R) (2005) , , , [DOI:10.1103/PhysRevA.72.050302], [LaTeX], [BibTeX]. Karl Svozil, ``Noncontextuality in multipartite entanglement'' , J. Phys. A: Math. Gen. 38 (25), 5781-5798 (2005) , , , [DOI:10.1088/0305-4470/38/25/013], [LaTeX], [BibTeX]. Karl Svozil, ``Feasibility of the interlock protocol against man-in-the-middle attacks on quantum cryptography'' , International Journal of Quantum Information 3 (4), 649-654 (2005) [DOI: 10.1142/S0219749905001511], , , , [LaTeX], [BibTeX]. Karl Svozil, ``Logical Equivalence Between Generalized Urn Models and Finite Automata'' , International Journal of Theoretical Physics 44 (7), 745-754 (2005) , , , [DOI: 10.1007/s10773-005-7052-0], [LaTeX], [BibTeX]. Karl Svozil, ``Computational universes'' , Chaos, Solitons & Fractals 25 (4), 845-859 (2005) , , , [DOI: 10.1016/j.chaos.2004.11.055], [LaTeX], [BibTeX]. Cristian S. Calude, Ludwig Staiger and Karl Svozil, ``Randomness relative to Cantor expansions'', Communications in Nonlinear Science and Numerical Simulation 10 (8), 921-930 (2005) , , , [DOI: 10.1016/j.cnsns.2004.05.003], [LaTeX], [BibTeX]. Stefan Filipp and Karl Svozil, ``Generalizing Tsirelson's Bound on Bell Inequalities Using a Min-Max Principle'', Physical Review Letters 93, 130407 (2004) , , , [DOI: 10.1103/PhysRevLett.93.130407], [LaTeX], [BibTeX]. Karl Svozil, ``Eutactic quantum codes'', Physical Review A 69, 034303 (2004). [DOI:10.1103/PhysRevA.69.034303], , , , [LaTeX], [BibTeX]. This article has been selected by the APS for the Virtual Journal of Quantum Information 4 (3) (March 2004) [VJQI issue]. Volkmar Putz and Karl Svozil, ``Quantum electrodynamics in the squeezed vacuum state: electron mass shift'', Il Nuovo Cimento B 119, 175-179 (2004). [DOI:10.1393/ncb/i2004-10051-8], , , , [BibTeX]. Karl Svozil, ``Quantum information via state partitions and the context translation principle'', Journal of Modern Optics 51, 811-819 (2004). [DOI:10.1080/09500340410001664179], , , , [LaTeX], [BibTeX]. Stefan Filipp and Karl Svozil, ``Testing the bounds on quantum probabilities'', Physical Review A 69, 032101 (2004) [DOI:10.1103/PhysRevA.69.032101], , , , [LaTeX], [BibTeX]. This article has been selected by the APS for the Virtual Journal of Quantum Information 4 (3) (March 2004) [VJQI issue]. Karl Svozil, ``Quantum information in base n defined by state partitions'', Physical Review A 66, 044306 (2002) [DOI:10.1103/PhysRevA.66.044306], , , , , [LaTeX], [BibTeX]. This article has been selected by the APS for the Virtual Journal of Quantum Information 2 (11) (November 2002) [VJQI issue]. Niko Donath and Karl Svozil, ``Finding a state among a complete set of orthogonal states'' Physical Review A 65, 044302 (2002) [DOI:10.1103/PhysRevA.65.044302], , , , , [LaTeX], [BibTeX]. This article has been selected by the APS for the Virtual Journal of Quantum Information 2 (4) (April 2002) [VJQI issue]. Karl Svozil, ``Conventions in relativity theory and quantum mechanics'' Foundations of Physics 32(4), 479-502 (2002); An appendix contains a complete proof of Alexandrov's theorem using methods of affine geometry. [DOI:10.1023/A:1015017831247], , , , [LaTeX]. (Karl Svozil, ``The chromatic number of a sphere. Solution of problem nr. 10769'' The American Mathematical Monthly 108, 774-775 (2001) [MAA online], [gif image], , [LaTeX], [BibTeX]. Itamar Pitowsky and Karl Svozil, ``Optimal tests of quantum nonlocality'' Physical Review A 64, 014102 (2001) [DOI:10.1103/PhysRevA.64.014102], , , , , [LaTeX], [BibTeX]. This article has been selected by the APS for the Virtual Journal of Quantum Information 1 (2) (July 2001) [VJQI issue]. Hans Havlicek, Guenther Krenn, Johann Summhammer and Karl Svozil, ``Coloring the rational quantum sphere and the Kochen-Specker theorem'', J. Phys. A: Math. Gen. 34 (14), 3071-3077 (13 April 2001) [DOI:10.1088/0305-4470/34/14/312], [htm], [qhant-phys], , . Karl Svozil, ``[Book Review:] Quantum Logic in Algebraic Approach, by Miklos Redei'', Studies In History and Philosophy of Science Part B: Studies In History and Philosophy of Modern Physics 32(1), 113-115 (2001) [DOI:10.1016/S1355-2198(00)00005-8], , . C.S. Calude, M.J. Dinneen and Karl Svozil ``Reflections on Quantum Computing'', Complexity 6(1), 35-37 (2000) [DOI:10.1002/1099-0526(200009/10)6:1<35::AID-CPLX1005>3.0.CO;2-T], , , ]. Georges Chevalier, Anatolij Dvurecenskij and Karl Svozil, ``Piron�s and Bell�s Geometric Lemmas and Gleason�s Theorem'' , Foundations of Physics 30(10), 1737-1755 (2000) [DOI:10.1023/A:1026458519154], , . Karl Svozil, ``Relativizing Relativity'', Foundations of Physics 30(7), 1001-1016 (2000) [DOI:10.1023/A:1003600519752], , . G. Franck-Oberaspach, D. B. Schweiger and Karl Svozil, ``A Packing Problem, Solved by Genetic Algorithms'', Journal of Universal Computer Science (Springer) 5, 464-470 (1999) . G. Krenn, J. Summhammer and Karl Svozil, ``Interferometric information gain versus interaction-free measurement'' Physical Review A 61, 052102 (2000) [DOI:10.1103/PhysRevA.61.052102], . Karl Svozil and Douglas Bridges, ``Constructive mathematics and quantum physics'', International Journal of Theoretical Physics 39 (3), 503-515 (2000) [DOI:10.1023/A:1003613131948], , . Karl Svozil, ``Logic of reversible automata'', International Journal of Theoretical Physics 39 (3), 893-899 (2000) [DOI:10.1023/A:1003639232374], , , . R. Sedivy, Ch. Windischberger, Karl Svozil, E. Moser and G. Breitenecker, ``Fractal Analysis: An Objective Method for Identifying Atypical Nuclei in Dysplastic Lesions of the Cervix Uteri'', Gynecologic Oncology 75(1), October 1999, 78-83 (1999) [DOI:10.1006/gyno.1999.5516], . Cristian S. Calude, Peter H. Hertling and Karl Svozil, ``Embedding Quantum Universes in Classical Ones'', Foundations of Physics 29(3), 349-390 (1999) [DOI:10.1023/A:1018862730956], , , , [LaTeX], [BibTeX]. Klaus Ehrenberger, Dominik Felix and Karl Svozil, ``Stochastic resonance in cochlea signal transduction", Acta Oto-Laryngologica 118, 7-8 (1998); 119, 166-170 (1999) [DOI:10.1080/00016489950181594]. Klaus Ehrenberger and Karl Svozil, ``Aging and Complexity in Equilibrium Dynamics", Chaos, Solitons & Fractals 10, 1085-1086 (1999) , , [LaTeX], [BibTeX], [DOI:10.1016/S0960-0779(98)00146-5]. Cristian S. Calude, Peter H. Hertling and Karl Svozil, ``Kochen-Specker theorem: two geometrical proofs'', Tatra Mountains Mathematical Publications 15 (2), 133-142 (1998) , , , [LaTeX], [BibTeX]. Karl Svozil, ``Analogues of quantum complementarity in the theory of automata'', Studies In History and Philosophy of Science Part B: Studies In History and Philosophy of Modern Physics 29, 61-80 (1998) [DOI:10.1016/S1355-2198(97)00028-2], , . G. Krenn and Karl Svozil, ``Stronger-than-quantum correlations'', Foundation of Physics 28 (6), 971-984 (1998) [DOI:10.1023/A:1018821314465], , . S. Pulmannová and Karl Svozil, ``Ideals in ortholattices, Bell inequalities and simultaneously definite properties'', International Journal of Theoretical Physics 36 (7), 1547-1564 (1997) [DOI:10.1007/BF024357555], . Cristian Calude, Elena Calude, Karl Svozil and Sheng Yu, ``Physical versus Computational Complementarity I'', International Journal of Theoretical Physics 36, 1495-1523 (1997). Anatolij Dvurecenskij and Karl Svozil, ``Product of Partition Logics, Orthoalgebras and Automata'', International Journal of Theoretical Physics 35 (11), 2377-2390 (1996) [DOI:10.1007/BF02302454], . Karl Svozil and Josef Tkadlec, ``Greechie diagrams, nonexistence of measures in quantum logics and Kochen-Specker type constructions'', Journal of Mathematical Physics 37, 5380-5401 (1996) [DOI:10.1063/1.531710], , , [LaTeX], [BibTeX]. Karl Svozil, D. Felix and K. Ehrenberger, ``Amplification by stochastic interference'', J. Phys. A: Math. Gen. 29, L351-L354 (1996) [DOI:10.1088/0305-4470/29/13/007], , . Hans Havlicek and Karl Svozil, ``Density conditions for quantum propositions'', Journal of Mathematical Physics 37, 5337-5341 (1996) , , , [DOI:10.1063/1.531738], [LaTeX], [BibTeX]. Karl Svozil, ``Quantum algorithmic information theory'', Journal of Universal Computer Science 2, 311-346 (1996) , , . Karl Svozil and R. R. Zapatrin, ``Empirical logic of finite automata: microstatements versus macrostatements'', International Journal of Theoretical Physics, 35, 1541-1548 (1996) [DOI:10.1007/BF02084959]. Wolfgang Gstoettner, Wolf Baumgartner, Jafar Hamzavi, Dominik Felix, Karl Svozil, Reiner Meyer und Klaus Ehrenberger, ``Auditory fractal random signals: Experimental data and clinical application", Acta Oto-Laryngologica 116, 222-223 (1996). Karl Svozil and N. Neufeld, `` `Linear' chaos via paradoxical set decompositions'', Chaos, Solitons & Fractals 7 (5), 785-793 (1996) [DOI:10.1016/0960-0779(95)00116-6], , . Martin Schaller and Karl Svozil, ``Automaton logic'', International Journal of Theoretical Physics 35, 911-940 (1996) [DOI:10.1007/BF02302381], , . N. Brunner, Karl Svozil and M. Baaz, ``The axiom of choice in quantum theory'' Mathematical Logic Quarterly 42 319-340 (1996). G. Krenn, J. Summhammer and Karl Svozil, ``Interaction-Free Preparation'' Physical Review A 53, 1228-1231 (1996) [DOI:10.1103/PhysRevA.53.1228], , . Karl Svozil, ``How real are virtual realities, how virtual is reality? The constructive re-interpretation of physical undecidability'', Complexity, 1, 43-54 (1996). Karl Svozil, ``Time paradoxa reviewed'', Phys. Lett. A 199, 323-326 (1995). [DOI:10.1016/0375-9601(95)00129-Q], , . Karl Svozil, ``Halting probability amplitude of quantum computers'', Journal of Universal Computer Science 1, nr. 3, 1-4 (March 1995) [DOI:10.3217/jucs-001-03-0201], , . Karl Svozil, ``Set Theory and Physics'', Foundations of Physics, 25, 1541-1560 (1995) [DOI:10.1007/BF02055507], , . K. Ehrenberger, D. Felix and Karl Svozil, ``Origin of Auditory Fractal Random Signals in Guinea Pigs'', NeuroReport 6, 2117-2120 (1995). A. Dvurecenskij, S. Pulmannová and Karl Svozil, ``Partition Logics, Orthoalgebras and Automata''. Helvetica Physica Acta 68(5), 407-428 (1995), [DOI:10.5169/seals-116747], . . .
Karl Svozil, ``Consistent use of paradoxes in deriving contraints on the dynamics of physical systems and of no-go-theorems'', Foundations of Physics Letters 8, 523-535 (1995) [DOI:10.1007/BF02186244], , . Martin Schaller and Karl Svozil, ``Automaton partition logic versus quantum logic'', International Journal of Theoretical Physics 34, 1741-1749 (1995) [DOI:10.1007/BF00676288], [htm], . N. Brunner, Karl Svozil and M. Baaz, ``Effective quantum observables'' Il Nuovo Cimento B110, 1397-1413 (1995). Martin Schaller and Karl Svozil, ``Partition logics of automata'', Il Nuovo Cimento B 109, 167-176 (1994), , , [DOI: 10.1007/BF02727427], [LaTeX], [BibTeX]. Karl Svozil, D. Felix and K. Ehrenberger, ``Multiple-channel fractal information coding of mammalian nerve signals'', Biochemical and Biophysical Research Communications 199, 911-915 (1994), , [DOI: 10.1006/bbrc.1994.1315], [BibTeX]. Karl Svozil, ``Squeezed fermion states'', Physical Review Letters 65, 3341-3343 (1990) [DOI:10.1103/PhysRevLett.65.3341], , . P. W. Milonni and Karl Svozil, ``Impossibility of measuring faster-than-light signaling by the Scharnhorst effect'', Phys. Lett. B 248, 437-438 (1990) [DOI:10.1016/0370-2693(90)90317-Y], [LaTeX], , . Karl Svozil, ``Constructive chaos by Cellular Automata and possible sources of an arrow of time'', Physica D45, 420-427 (1990); reprinted Cellular Automata, Theory and Experiment, ed. by H. Gutowitz (MIT Press, Cambridge, MA, 1991). Karl Svozil, ``Comment on `Comment on quantum cosmology and the initial state of the universe' '', Physical Review D 41, 1353-1354 (1990) [DOI:10.1103/PhysRevD.41.1353], , , ``Erratum: Comment on`Comment on quantum cosmology and the initial state of the universe' '', Physical Review D 44, 567-568 (1991) , . Karl Svozil, ``Test of local causality with very short light pulses'', Physical Review A 39, 2222-2224 (1989) [DOI:10.1103/PhysRevA.39.2222], , , ``Reply to ``Comment on `Test of local causality with very short light pulses' '' Physical Review A 41, 1729 (1990) [DOI:10.1103/PhysRevA.41.1729], , . Karl Svozil, ``The quantum coin toss-testing microphysical undecidability'', Phys. Lett. A 143, 433-437 (1990). [DOI:10.1016/0375-9601(90)90408-G], , . Karl Svozil, ``Are chaotic systems dynamically random? '', Phys. Lett. A 140, 5-9 (1989) [DOI:10.1016/0375-9601(89)90536-7], . Karl Svozil and R. Lassnig, ``Raman spectroscopy in high-temperature superconducting materials'', Physical Review B 37, 3654-3656 (1988) [DOI:10.1103/PhysRevB.37.3654], , . Karl Svozil and A. Zeilinger, ``Is there a breakdown of QED in (g-2)-measurements? '', Physica Scripta T21, 122 (1988) [DOI:10.1088/0031-8949/1988/T21/022], . Karl Svozil, ``New form of pair interaction in superconductivity in pressure-sensitive systems'', Physical Review B 36, 715-717 (1987) [DOI:10.1103/PhysRevB.36.715], , . V. V. Moshchalkov and Karl Svozil, ``Phenomenological model of superconductivity in U1−xThxBe13'', Phys. Lett. A 120, 356-360 (1987). [DOI:10.1016/0375-9601(87)90731-6], . O.V.Dolgov, E.P.Fetisov, D.I.Khomskii and Karl Svozil, ``Model of interband pairing in mixed valence and heavy fermion systems'', Z. Phys. B 67, 63-68 (1987) [DOI:10.1007/BF01307308]. Karl Svozil, ``Test of s-wave pairing in heavy-fermion systems due to Kondo volume collapse'', Physical Review B 35, 7113-7114 (1987) [DOI:10.1103/PhysRevB.35.7113], , . Karl Svozil, ``Quantum field theory on fractal space-time'', J. Phys. A: Math. Gen. 20, 3861-3875 (1987) [DOI:10.1088/0305-4470/20/12/033], , . Karl Svozil, ``Renormalization of the quantum theory of the solid state'', Fortschritte der Physik (Progress of Physics) 35, 65-85 (1987). Karl Svozil, ``Model for p- and d-wave superconductivity in heavy fermion systems'', Physical Review B 33, 602-604 (1986) [DOI:10.1103/PhysRevB.33.602], , . M. Kreuzer and Karl Svozil, ``QED between plates: mass and anomalous magnetic moment of an electron'', Physical Review D 34, 1429-1437 (1986) [DOI:10.1103/PhysRevD.34.1429], , . Karl Svozil, ``Connections between deviations from Lorentz transformation and relativistic energy-momentum relation'', Europhysics Letters 2, 83-85 (1986) [DOI:10.1209/0295-5075/2/2/002], , . Karl Svozil, ``Operational perception of space-time coordinates in a quantum medium'', Il Nuovo Cimento 96B, 127-139 (1986) . Karl Svozil and A. Zeilinger, ``Dimension of space-time'', International Journal of Modern Physics A (IJMPA) 1 (4), 971-990 (1986). [DOI:10.1142/S0217751X86000368], , . Karl Svozil, ``Dimensional reduction via dimensional shadowing'', J. Phys. A: Math. Gen. 19, L1125-L1127 (1986) [DOI:10.1088/0305-4470/19/18/002], , . Karl Svozil, ``Are quantized fields Cellular Automata? '', Phys. Lett. A 119, 153-156 (1986) [DOI:10.1016/0375-9601(86)90436-6], . A. Zeilinger and Karl Svozil, ``Measuring the dimension of space-time'', Physical Review Letters 54, 2553-2555 (1985) [DOI:10.1103/PhysRevLett.54.2553], , . Karl Svozil, ``Mass and anomalous magnetic moment of an electron between two conducting parallel plates'', Physical Review Letters 54, 742-744 (1985) [DOI:10.1103/PhysRevLett.54.742], , . Karl Svozil, ``Raman scattering on superconductors in the presence of charge-density states'', Physical Review B 31, 4688-4689 (1985) [DOI:10.1103/PhysRevB.31.4688], , . Karl Svozil, ``A new type of charge screening due to phonon-Coulomb mixing in many-body physics'', Phys. Lett. A 106, 264 - 266 (1984). [DOI:10.1016/0375-9601(84)91024-7], . Karl Svozil, ``Comprehensive study of the renormalization of the theory of strong-coupling superconductors'', Physical Review B 30, 1357-1361 (1984) [DOI:10.1103/PhysRevB.30.1357]. .
Karl Svozil, ``Weak spectral functions and their application to the decay of the W-boson'', Lettere al Nuovo Cimento 39, 294 - 298 (1984). Karl Svozil, ``Remarks on a lower bound for the critical temperature from the real-frequency Eliashberg equations'', Acta Physica Austr. 55, 229 - 232 (1984). H. Pietschmann, H. Rupertsberger and Karl Svozil, ``Possible tests of the weak boson self-coupling below the -threshold'', Z. Physik C 12, 367 - 368 (1982) [DOI:10.1007/BF01557582]. .
H. Rupertsberger and Karl Svozil, ``Hadronic final states in the decay and the weak boson self-energy'', Acta Physica Austr. 54, 255-263 (1982). Karl Svozil, ``Entanglement through Path Identification'', in Mathematics Almost Everywhere. In Memory of Solomon Marcus, ed. by Alexandra Bellow, Cristian S Calude and Tudor Zamfirescu (World Scientific, Singapore, 2018), ISBN: 978-981-3237-30-8 (hardcover), 978-981-3237-32-2, pp. 211-218 [DOI: 10.1142/9789813237315_0012], , , , [LaTeX], [BibTeX]. Karl Svozil, ``Generalized event structures and probabilities'', in Information and Complexity. World Scientific Series in Information Studies: Volume 6, ed. by Mark Burgin and Cristian S Calude (World Scientific, Singapore, 2016), ISBN: 978-981-3109-02-5,978-981-3109-04-9, pp. 276-300 [DOI: 10.1142/9789813109032_0011], , , , [LaTeX], [BibTeX]. Karl Svozil, ``Quantum Queries Associated with Equi-partitioning of States and Multipartite Relational Encoding Across Space-Time'', in Advances in Unconventional Computing: Volume 1: Theory, ed. by Andrew Adamatzky (Springer, Cham, Heidelberg, New York, Dordrecht, London, 2016), ISBN: 978-3-319-33924-5, pp. 429-438 [DOI: 10.1007/978-3-319-33924-5_16], , , , [LaTeX], [BibTeX]. Karl Svozil, ``Physical Aspects of Oracles for Randomness and Hadamard's Conjecture'', in Springer Lecture Notes in Computer Science 8808 - Computing with New Resources (Essays Dedicated to Jozef Gruska on the Occasion of His 80th Birthday), ed. by Cristian S. Calude, Rusin� Freivalds and Iwama Kazuo (Springer, Cham, Heidelberg, New York, Dordrecht, London, 2014), ISBN: 978-3-319-13349-2 (Print) 978-3-319-13350-8 (Online), pp. 223-230 [DOI: 10.1007/978-3-319-13350-8_17], , , , [LaTeX], [BibTeX]. Alastair Abbot, Cristian S. Calude and Karl Svozil, ``A quantum random oracle'', in The selected works of A.M. Turing: his work and impact, ed. by S. Barry Cooper and J. van Leeuwen (Elsevier, Amsterdam, 2013), pp. 206-210. Cristian S. Calude and Karl Svozil, ``Is Feasibility in Physics Limited by Fantasy Alone? '', in A Computable Universe, ed. by Hector Zenil (World Scientific, Singapore, 2012), pp. 539-547 [DOI: 10.1142/9789814374309_0027], , , , [LaTeX], [BibTeX]. Karl Svozil, ``Haunted Quantum Contextuality versus Value Indefiniteness'', in Computation, Physics and Beyond, International Workshop on Theoretical Computer Science, WTCS 2012, Dedicated to Cristian S. Calude on the Occasion of His 60th Birthday, Auckland, New Zealand, February 21-24, 2012, Revised Selected and Invited Papers, Lecture Notes in Computer Science, Volume 7160/2012 , ed. by Michael J. Dinneen, Bakhadyr Khoussainov und Andr� Nies (Springer, New York, Heidelberg, 2012), pp. 309-314 [DOI:10.1007/978-3-642-27654-5_23], , , , [LaTeX], [BibTeX]. Karl Svozil, ``Physical Unknowables'', in Kurt G�del and the Foundations of Mathematics, ed. by Matthias Baaz, Christos H. Papadimitriou, Hilary W. Putnam, Dana S. Scott and Charles L. Harper (Cambridge University Press, Cambridge, 2011), pp. 213-251 , , , [LaTeX], [BibTeX]. Karl Svozil, ``Indeterminism and Randomness Through Physics'', in Randomness Through Computation. Some Answers, More Questions, ed. by Hector Zenil (World Scientific, Singapore, 2011), pp. 109-120 , , [LaTeX], [BibTeX]. Karl Svozil, ``On the Brightness of the Thomson Lamp: A Prolegomenon to Quantum Recursion Theory'', in Unconventional Computation. 8th International Conference, UC 2009, Ponta Delgada, Portugal, September 7-11, 2009, Proceedings (Series: Lecture Notes in Computer Science, Subseries: Theoretical Computer Science and General Issues , Vol. 5715), ed. by C.S. Calude, J.F.G.d. Costa, N. Dershowitz, E. Freire and G. Rozenberg (Springer, Berlin, Heidelberg, 2009), pp. 236-246 , [DOI: 10.1007/978-3-642-03745-0_26], , , [LaTeX]. Karl Svozil, ``Contexts in quantum, classical and partition logic'', in Handbook of Quantum Logic and Quantum Structures, ed. by Kurt Engesser, Dov M. Gabbay and Daniel Lehmann (Elsevier, Amsterdam, 2008), pp. 551-586 , [DOI: 10.1016/B978-0-444-52869-8.50015-3], , , [LaTeX], [BibTeX]. Karl Svozil, ``Physics and metaphysics look at computation'', in Church's Thesis after 70 years, ed. by Adam Olszewski, Jan Wolenski and Robert Janusz (Ontos Verlag, Frankfurt, Paris, 2006), pp. 491-517 :physics/0508207, , [LaTeX]. Karl Svozil, ``Computational Universes'', in Space Time Physics and Fractality, ed. by Peter Weibel, Garnet Ord and Otto E. R�ssler (Springer Verlag, Wien, New York, 2005), pp. 144-173 ]. , [LaTeX]. Daniel M. Greenberger and Karl Svozil, ``Quantum Theory Looks at Time Travel'', in Quo Vadis Quantum Mechanics?, ed. by A. Elitzur, S. Dolev and N. Kolenda (Springer Verlag, Berlin, 2005), pp. 63-72 [DOI:10.1007/3-540-26669-0_4], ]. , , [LaTeX]. Stefan Filipp and Karl Svozil, ``Tracing the Bounds on Bell-Type Inequalities'', in AIP Conference Proceedings 750. Foundations of Probability and Physics-3, ed. by Andrei Khrennikov (American Institute of Physics, Melville, NY, 2005), pp. 87-94 [DOI:10.1063/1.1874561], , , , , [LaTeX]. [BibTeX]. Karl Svozil, ``On Counterfactuals and Contextuality'', in AIP Conference Proceedings 750. Foundations of Probability and Physics-3, ed. by Andrei Khrennikov (American Institute of Physics, Melville, NY, 2005) pp. 351-360 [DOI:10.1063/1.1874586], , , [LaTeX], [BibTeX]. Karl Svozil, ``Conventions in Relativity Theory and Quantum Mechanics,'' La nuova Critica. Nuova Serie 43-44 (1-2), 59-70 (2004). Karl Svozil, ``Finite Automata models of quantized system: conceptual status and outlook'', in Developments in Language Theory. Proceedings of the 6th International Conference, DLT 2002, Kyoto, Japan, September 2002, ed. by Masami Ito and Masafumi Toyama (Springer, Berlin 2003), pp. 93-102, [DOI:10.1007/3-540-45005-X_8], , , [LaTeX], [BibTeX]. Stefan Filipp und Karl Svozil, ``Boole-Bell-type inequalities in Mathematica'', in Challenging the Boundaries of Symbolic Computation, Proceedings of the 5th International Mathematica Symposium, Imperial College London 7-11 July 2003, ed. by Peter Mitic, Philip Ramsden and Janet Carne (Imperial College Press, London 2003), pp. 215-222, , [Mathematica Notebook]. Daniel Greenberger and Karl Svozil, ``A quantum mechanical look at time travel and free will'', in Between Chance and Choice, ed. by Harald Atmanspacher and Robert Bishop (Imprint Academic, Thorverton 2002), pp. 293-308, , , [LaTeX], [BibTeX]. Karl Svozil, ``Science at the crossroad between randomness and determinism'' in Millennium III, ed. by Cristian Calude and Karl Svozil (Black Sea University Foundation, in collaboration with the Romanian Academy of Sciences and the Club of Rome, Bucharest 2001), pp. 73-84, , , [LaTeX], [BibTeX]. Karl Svozil, ``Quantum interfaces'', in Sciences of the Interface, ed. by Hans H. Diebner, Timothy Druckrey and Peter Weibel, (Genista Verlag, T�bingen 2001), pp. 76-88, , [LaTeX], [BibTeX], ]. Karl Svozil, ``Quantum information: the new frontier'' Unconventional Models of Computation UMC'2K, ed. by I. Antiniou, C.S. Calude and M.J. Dinneen, (Springer, London, Berlin, Heidelberg 2001), pp. 248-272. C. S. Calude, E. Calude, Karl Svozil, ``Computational Complementarity for Probabilistic Automata'', in Where Mathematics, Computer Science, Linguistics and Biology Meet, ed. by C. Martin-Vide, G. Paun (Kluwer Academic Publishers, Amsterdam 2000), pp. 99-113, , [abstract]. C. S. Calude, E. Calude, Karl Svozil, Quantum Correlations Conundrum, in Recent Topics in Mathematical and Computational Linguistics, ed. by C. Martin-Vide, G. Paun (Editura Academiei Romane, Bucharest 2000), pp. 55-67. Karl Svozil, ``Information and Complementarity'', The Quest for a Unified Theory of Information, ed. b. Wolfgang Hofkirchner (Gordon and Breach Publishers, Amsterdam, 1999), pp. 305-314. Karl Svozil, ``Quantum logic. A brief outline'', Mathematical and Quantum Logic. Proceedings of the 4th Summer School on Analysis, Geometry and Mathematical Physics on August 3-9, 1997 in Karlovassi, Samos, ed. by K. Keremedis (Sete, Karlovassi, 1998). , [LaTeX], [BibTeX]. Karl Svozil, ``The limits of mathematics. A book review'', Complexity 3, 63 (1998). Karl Svozil, ``The Church-Turing Thesis as a Guiding Principle for Physics'', in Unconventional Models of Computation, ed. by Cristian S. Calude, John Casti and Michael J. Dinneen (Springer, Singapore, 1998), pp. 371-385. , [LaTeX], [BibTeX], ]. Karl Svozil, ``Information and the Complementarity Game'', World Futures 50, 523-532 (1997). Karl Svozil, ``On self-reference and self-description'', La nuova Critica. Nuova Serie 29 (1), 75-86 (1997). Reprinted in Functional Models of Cognition; ed. by A. Carsetti (Kluwer, Dordrecht, 2000), p. 189-197 [book-reference]. Karl Svozil, ``Undecidability everywhere? '', in Boundaries and Barriers. On the Limits to Scientific Knowledge, ed. by J. L. Casti and A. Karlquist (Addison-Wesley, Reading, MA, 1996), pp. 215-237. [BibTeX], [LaTeX], . Karl Svozil, ``The physics of virtual realities'', in Endophysics: The World From Within, ed. by George Kampis and Peter Weibel (Aerial, Santa Cruz, 1993). Karl Svozil, ``Quantum computation and complexity theory I'', Bulletin of the European Association of Theoretical Computer Sciences 55, 170-207 (1995). Karl Svozil, ``Quantum computation and complexity theory II'', Bulletin of the European Association of Theoretical Computer Sciences 56, 116-136 (1995). Cristian Calude, Douglas I. Campbell, Karl Svozil and Doru Stefanescu, ``Strong Determinism vs. Computability'', The Foundational Debate, Complexity and Constructivity in Mathematics and Physics, Werner DePauli Schimanovich, Eckehart Köhler and Friedrich Stadler, eds. (Kluwer, Dordrecht, Boston, London, 1995), p. 115-131. , [LaTeX], , . Karl Svozil, ``On the computational power of physical systems, undecidability, the consistency of phenomena and the practical uses of paradoxa'', in Fundamental Problems in Quantum Theory: A Conference Held in Honor of Professor John A. Wheeler, ed. by D. M. Greenberger and A. Zeilinger, Annals of the New York Academy of Sciences 755, 834-841 (1995) [DOI: 10.1111/j.1749-6632.1995.tb39024.x], , [LaTeX], [BibTeX]. Karl Svozil, ``A constructivist manifesto for the physical sciences - Constructive re-interpretation of physical undecidability'', in The Foundational Debate, Complexity and Constructivity in Mathematics and Physics, Werner DePauli Schimanovich, Eckehart Köhler and Friedrich Stadler, eds. (Kluwer, Dordrecht, Boston, London, 1995), p. 65-88. [DOI: 10.1007/978-94-017-3327-4_6], , , [LaTeX], BibTeX]. Karl Svozil, ``How many physical parameters form a minimal and complete description of the world?'' in Nuclei in the Cosmos, ed. by H. Oberhummer (Springer, Berlin, 1991). M. Baaz, N. Brunner and Karl Svozil, ``Interpretations of combinatory algebras'', in Philosophy of Mathematics, Part 1, ed. by J. Czermak (Hölder-Pichler-Tempsky, Berlin, 1993), p. 393-406. Karl Svozil, ``Mathematical foundation of physical chaos'', in Gödel Jahrbuch 1, ed. by N. Brunner et al. (Vienna 1988), 53-85. Karl Svozil and R. Lassnig, ``Test of phonon mediated pairing from Raman scattering on high-temperature superconducting materials'', in High- superconductors, ed. by W. Weber (Plenum Press, New York 1988), p. 177-182. Karl Svozil, ``Metrology of space-time dimension'', in Fundamental Aspects of Quantum Theory (Proc. NATO Advanced Research Study Seminar, Como 1985), eds. V. Gorini and A. Frigerio, (Plenum, New York), p. 447-449. Vorrichtung zur Abkühlung von punktförmigem Kühlgut durch Strahlungswärme, Patent Nr. 393900, erteilt am 12. 11. 1991. Please have a look at arXiv.org for some of my later preprints & papers.